I used to review new stored procedure which is going to be live. Recently I have seen that one of the developers has developed one stored procedure which had logic of inserting records if it doesn’t exists already and update some value if record is already exists. He has used complex logic with IF…ELSE and SELECT…EXISTS. Since we are having SQL Server 2008 R2 in that particular server, it is not need to develop complex logic but we can simply use MERGE statement which was introduced from SQL Server 2008. MERGE statement was one of the very good enhancements in TSQL in SQL Server 2008 though people don’t use to use it much due to unawareness. MERGE statement will allow you to use any combination of INSERT, UPDATE & DELETE with simple MERGE statement and without having any complex logic which used to have till SQL Server 2005. Apart from that MERGE statement read and process data at once so that you reduce roundtrip of the server which ultimately enhances the performance. Above query will delete one record from SalesOrderDetail table and Update one record in SalesOrderDetail table in AdventureWorks database. It won’t insert any record as there is no record which is exists in SaleOrderHeader table which doesn’t have child entry in SalesOrderDetails table. 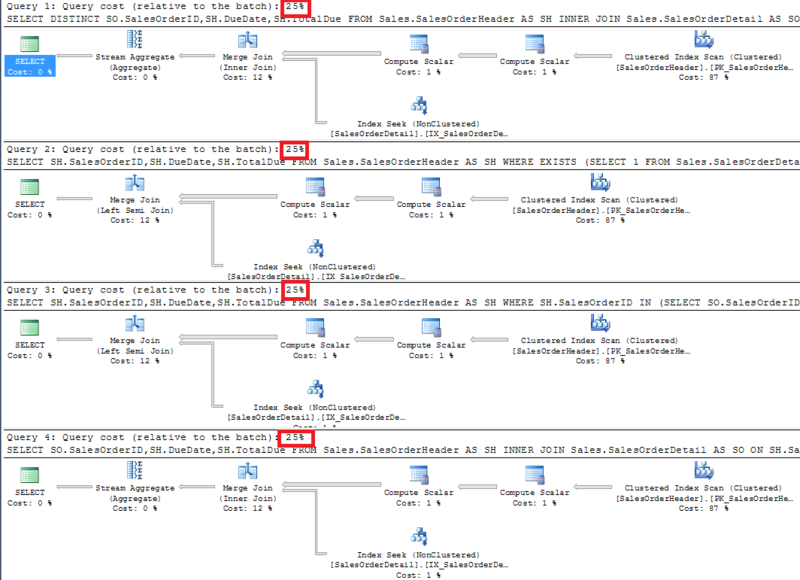 This entry was posted in MERGE, sql server, TSQL and tagged MERGE, SQL Server, TSQL on January 3, 2013 by Riteshshah. DISTINCT is really useful and handy whenever you wanted to have distinct value in your result set but nothing comes free and DISTINCT keyword is not an exception. 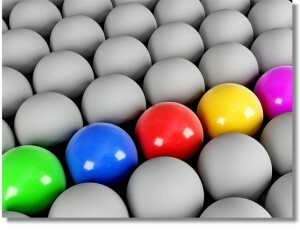 If your database is properly normalized, you face less issue to use DISTINCT. DISTINCT and performance of SELECT query is long debated topic and today I come up with my findings and experience with DISTINCT. I have also seen some myth hovering around DISTINCT. I have seen few very popular blog post which suggest to use GROUP BY or sub query or EXISTS over the DISTINCT keyword to gain performance over DISTINCT keyword but personally I don’t believe it. SQL Server is very smart and it always try to find best suited execution plan for your query. BTW, I will not give name of those blog post and author, however if you are eager then you can search google with terms something like “speed up DISTINCT query” or “performance of DISTINCT in SQL Server” or anything else which has “DISTINCT” and “Performance” together. Anyway, let us move on and find the effect of DISTINCT keyword on SELECT query. I have prepared demonstration in AdventureWorks2012 database so either download it from CODEPLEX website or use your own database by changing table name in the queries. Here are two simple SELECT query with and without DISTINCT. You can see that query with DISTINCT keyword uses more resource. Query with DISTINCT keyword is taking 77% of total batch execution time whereas without SELECT returning more row though it takes only 23%. I have tried to get unique SalesOrderID from SalesOrderDetail table, I should have get it from SalesOrderHeader table as there would be less records with unique SalesOrderID. This query could be considered as bad designed query. Now let us see whether there is any performance enhancement of GROUP BY or Sub Query or Exists or IN / NOT IN over DISTINCT key words. Here are some different queries which returns same data. 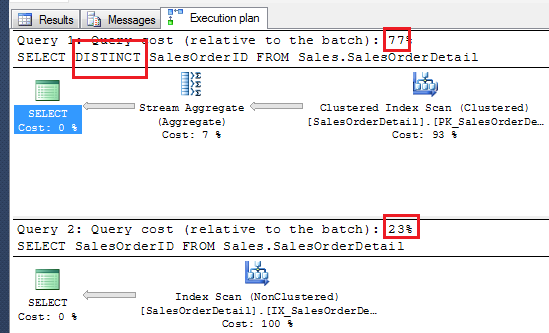 I have used DBCC command before each query so that previously created execution plan won’t be used. You can see each of the query above will return same number of row with exact same data, moreover there is no performance enhancement. No matter what condition or keyword you use, SQL Server will choose best suited plan for executing your query. You can confirm this by looking at following screen capture of execution plan. This entry was posted in DISTINCT, sql server, TSQL and tagged DISTINCT, SQL Server, TSQL on January 2, 2013 by Riteshshah.